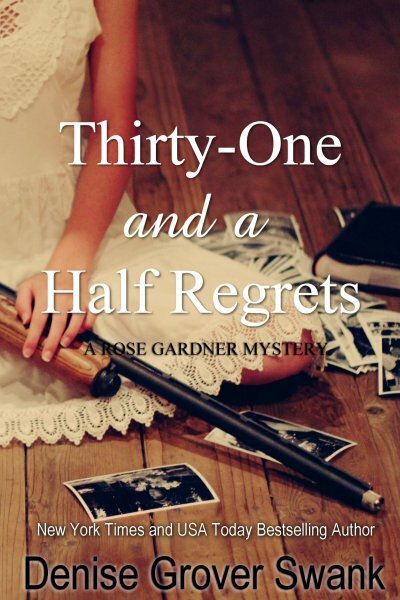 Only twenty more days until the release of Thirty-One and a Half Regrets! I’m so excited for you to read it! In the meantime, I’m answering your questions about Rose and the Rose Gardner series. No question is too crazy!!! Nothing is too invasive!!! Go ahead and ask me!!! I may not answer, but feel free to ask! Go ahead and tell me that I’m mean. My kids–and my characters– do all the time. Question #2 is all about Rose’s visions. Why does Rose have visions? What inspired her visions? Why does she blurt out what she sees? When I spent several hours coming up with the series concept, I thought giving Rose visions would be a interesting twist. I knew I wanted the series to be funny and this was one more way to make Rose and her small town quirky. Rose had insight others didn’t, even if she didn’t always understand what she saw. Blurting them out loud only added to the awkward situations she could get into. But the visions added something else–seeing the vision of herself dead in Twenty-Eight and a Half Wishes is the catalyst she needs to change her life. It’s interesting, I read a review that questioned whether Rose’s visions were necessary to the plot of Twenty-Eight and a Half Wishes. I can’t imagine Rose without them. It was also fun for me because in Chosen, five-year-old Jake had visions, but his were much more ominous and dangerous. I took the same “gift” and purposely turned it in the opposite direction. At the same time, this wasn’t an intentional decision. It was only after I started writing that I made the correlation to Chosen. However, I did realize that adding the slight paranormal aspect to the story could hurt my chances of selling the book to a publisher. No worries there since hardly any agents were interested in the story. And like Chosen, the query letter for Twenty-Eight is nearly identical to the blurb. Now for one last piece of trivia: Strangely enough, I forget to give Rose many visions in the first draft. When I send the first draft to my developmental editor with the list of issues I see that need to be fixed or addressed, I ALWAYS say that Rose needs to have more visions. I’m often still adding them at the very end in the third round of editing. I have no end date for the series at this point. I’ve said as long is still growing and doesn’t become a caricature, I’ll keep writing her. But I have committed to two more books in the series and both will come out this year, making a total of three Rose Gardner books in 2014.
oh my I just engulfed 31 and a half regrets. You are going to have to write faster as I cannot wait until June for complications. The complications are just swimming around in my head. I want her with Joe then I was ok with Mason and then I was like just marry Mason and forget Joe forever and now bam Joes back in the picture. I loved it. All the danger in this one kept me unable to put it down. Thank you but seriously I can’t wait until June. Thank you so, so much! I’m so happy you loved Rose!!! I fell upon this series by accident, got the first book free on ibooks and once I began reading it I couldn’t put it down. I read all 5 in 1 week and I am desperate to know what happens next. I love Joe I really hope she stays with him in the end. You are a very talented person. I absolutely love this series!!! I started reading last week and now I’m on Thirty One and a Half Regrets and I’m afraid to read it too quickly and have to wait a few weeks for the next one! Thank you so much for writing these, I cannot believe how in love with this story I am!